OMEGA's TX20B radio telemetry system is ideal for transmitting signals from sensors which are mounted on rotating shafts. The TX20B series miniature transmitters modulate sensor signals from thermocouples, voltage transducers, or strain gage bridge circuits onto a RF carrier and transmit them to a stationary receiver. The RX20B receiver demodulates the signal and converts it into a ±2 volt analog output. Two analog outputs signals are available simultaneously. A wide band output provides frequency response from dc to 1250 Hz. For maximum stability of the signal a filtered output is also available with a 0-10 Hz band width. TX20B transmitters incorporate a crystal oscillator which is tuned to a specific frequency eliminating the need for tuning by the operator. Transmitter frequencies can be staggered allowing multiple transmitters to be operated in close proximity with no interference. Multi-channel receivers are available. 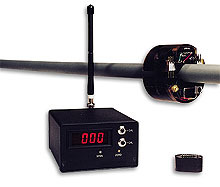 Transmitters are small enough in size to be taped or strapped to the rotating shaft and can be powered by a 9 V battery. For applications where continuous uninterrupted monitoring is necessary an inductively coupled power supply and transmitter are also available. The TX20B operates in a band which does not require an FCC license.